With ancestry relating back to the wolf, the Alaskan Malamute is a striking breed and is the largest of the Arctic sled dogs. Originating in Alaska, the Malamute’s brawn and stamina make it ideal for pulling heavy loads over great distances, thus making it adaptable to a variety of family activities. They are typically a quiet dog breed, but will bark or talk to let you know their needs or alert you when something is out of the ordinary. Characterized as strong-willed, independent and very alert, the Alaskan Malamute is an excellent family dog. They are loyal and, as a rule, quite fond of people. A highly intelligent breed, they are notoriously stubborn, so obedience training is recommended. They find training stimulating and enjoy interaction but may choose to play instead of train when bored. Be aware of their heightened prey drive around smaller animals, however; this is thought to be a remnant of their ancestry with wolves. If you decide to adopt a Malamute, you will need to socialize him with people, other dogs, and pets at an early age. If dogs, in general, are not properly socialized, they will often become anxious, depressed, or aggressive. The Alaskan Malamute is no exception to this rule. When they are puppies, socialize them with other canines, other pets (especially smaller ones), new environments, and new people. Then, they will know they are safe around others, even when you’re not there. Due to their size, Alaskan Malamutes may not adapt well to small apartment living since there just is not enough room. However, with proper exercise, they can adapt to more spacious indoor living and will typically be well-mannered indoors. They are great with children, loyal, and loving. 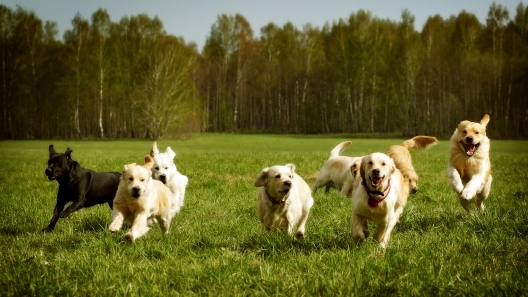 They can adapt to a wide variety of physical activities with their owners and would love a good jog daily. 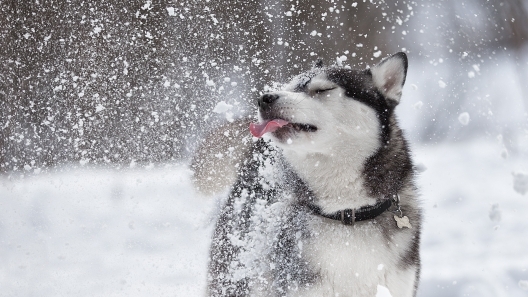 The Malamute adores cold weather so winter activities are a plus! They are a trusting breed and like to roam. Because they are pack-oriented, they much prefer company rather than spending long periods of time alone. It is important to establish control and teach your Malamute respect with other animals and children at an early age so it does not try to become dominant. The Alaskan Malamute is generally healthy but can be prone to hip or elbow dysplasia, cataracts, or hypothyroidism. 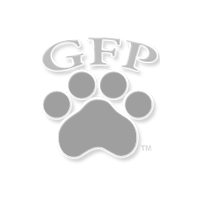 Other less common ailments such as gastric torsion, luxating patella, day blindness, and retinol atrophy can be found in the breed. Research on the Malamute breed will help ease your mind regarding these issues. To keep your pet healthy, we suggest regular vet checkups, a nourishing diet, and an exercise routine. Discuss ailments or possible future ailments with your vet. By deciding on a specific diet plan, you and your veterinarian will help your dog enjoy good health for years to come. Like humans, as your dog matures we also suggest beginning physical therapy and possible brainteasers. This will keep the mind and body sharp while they age. This energetic dog breed is usually not a good fit for novice dog owners. These large dogs are high-spirited and highly intelligent working dogs. They tend to pick up on commands easily, but they are also independent and can become hardheaded. An owner who is consistent, patient, firm, and kind with training will earn a Mal’s trust, respect, and devotion. They are sensitive souls, so they will not respond well to harsh commands or corrections. They also need a job to do as they can easily become bored. These dogs are working dogs bred for stamina and endurance. They have a lot of energy and a lot of brainpower, so it is important to keep them properly exercised and mentally engaged. Alaskan Malamutes are smart dogs and may make a game of outsmarting you to entertain themselves if they have not gotten enough exercise or if they become bored. Alaskan Malamutes have a dense double northern coat, and it is somewhat harsher than the smaller Siberian Husky. The usual colors are various shades of gray and white, sable and white, black and white, red and white, solid white, or even blue and white. The Malamute sheds its winter coat in spring and more grooming is needed to prevent matting. Daily brushing is recommended all year long to keep their coats healthy. Experts on the breed recommend a bath every 6 to 8 weeks, however, more frequent bathing will mean less shedding and a healthier coat and skin. The Malamute requires a substantial amount of exercise. Built for heavy work, daily walks and outside play time is a must to keep your dog happy and to avoid destructive behaviors. These pups are athletic and can adapt to a wide range of activities as a family member such as jogging, swimming, hiking, and, of course, sled/weight pulling activities. Alaskan Malamutes love to dig. It cannot be trained out of them because it is instinctive. Therefore, it is best to have an area designated for them to dig. You can train them to dig only in that location, saving your flower beds or yard from a digging disaster. The Malamute can be a chewer, so crate training is recommended when you are unable to supervise your puppy indoors. Provide plenty of chew toys and activity coupled with training to reduce chewing behaviors. They are 23 to 25 inches in height and 75 to 110 pounds in weight. A group of school children started a campaign to recognize the Alaskan Malamute as the official state dog of Alaska. Thanks to their efforts, this dog breed has served as the state dog of Alaska since 2010. Welcome to the Alaskan Malamute puppy page. The Malamute is a working class dog with a playful and friendly disposition. One of the oldest breeds of Arctic Sled dogs, they were used in the past to chase away polar bears and pull sleds. This breed was first recognized in 1935 by the AKC. It is vital that the Alaskan Malamute has an active lifestyle, and failure to properly exercise these dogs will result in an unhappy companion.